Discussion in 'MacRumors.com News Discussion' started by MacRumors, Nov 29, 2012. 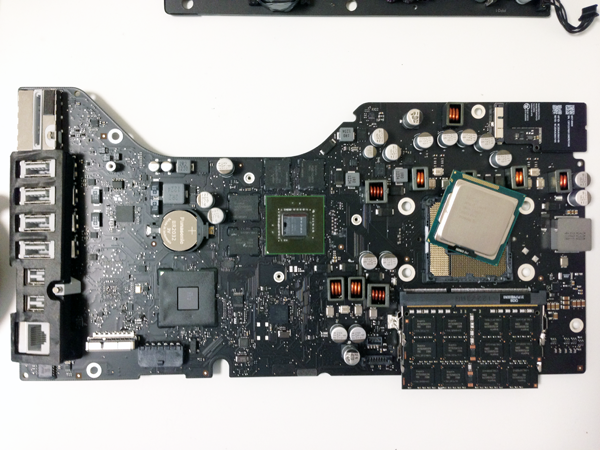 Meanwhile, Japanese site Kodawarisan has posted teardown photos showing the innards of the thin new machine. The new iMac tapers to a 5mm thin edge along the sides, requiring the use of a special welding technique to achieve the design. The 21.5" iMac will go on sale today in the U.S. both in retail stores and in the online Apple store with immediate availability. The 27-inch model will be available for pre-order but won't ship until December. Stock is expected to be tight throughout 2012. Talk about your 'Morning Smile': just turned on my computer at 9 am where I'm located to find a video of the new iMac. Thanks for this! Have a great day everyone. If I can connect a PC to the screen, I'll buy one. Otherwise I will get a revamped MacPro when it comes out. I love the rMBP as much as everybody else, but since desktops are typically further away, you probably can't see the pixels anyway. What I am more interested is the quality of the display and reduced reflections. A 21" retina would likely be cost prohibitive. Technically the 27" iMac already close to retina, in fact just a hear shy of the 15 RMBP. Especially since your viewing from over 2 feet. The only "real" retina displays are the iphone 4S/5 and the ipad. Gotta love the new iMac design. Did Apple take away features? Yes. (Super Drive replaced with an internal plastic wedge). Nice looking design. But the thing that most excites me about this release is the new (and long overdue) anti-reflective display coating. For that reason, it might just be the first iMac I purchase since the iMac G4. A nice machine in a living room. Beautiful design! That's actually a great unboxing video. Nicely done. I'm sorry, is that a REPLACEABLE PROCESSOR??? I was looking at that video and just thought "this is the future!" Wow! Is that thing pregnant?! A thin edge with a backside that looks like the back end of a bus. In fact by looking at the picture of the internals, I'm more tempted to ask just how much of the new iMac is simply empty space. I was looking at that video with a HUGE grin on my face and just thought "want!" That young man in the video looked quite content as well if I may say so. The cpu has always been socketed, but there's no point in replacing it. The top models take the cpu about as far as it can go in that socket. You really have nothing to put in its place if you're purchasing the top configurations. Beyond that it's LGA2011 and Sandy Bridge E.
Is the imac lighter? YES(by about 33% for the 27" model), this may not mean much to you, but guess what, an optical drive doesn't mean much to me. Some people move their imacs around quite a bit. Is it quieter? That one remains to be seen, but since there is no super drive whirring up means you get rid of a potential noise source. I for one am so happy about this new design, I cannot wait to sell my current imac and get one.